Ok Mike Winston, you are utterly responsible for our hopping on a train two stops south of Union Square for gyro's at Mama Gyro. I foolishly ordered the chicken, it was ok. The french fries were definitely yummy and they messed up M.'s order so it took awhile for the beef/lamb gyro's to come out, but once they did, we thoroughly enjoyed them. 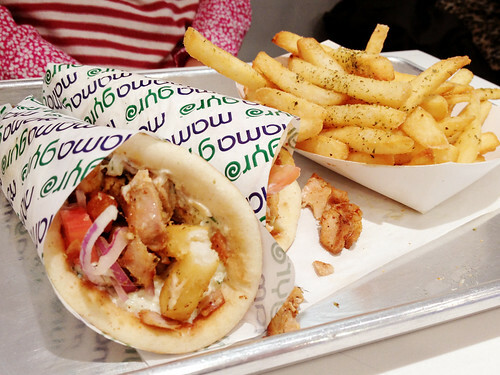 Next time we might have to order some yogurt to add a bit of sauciness to the pita. The entire venture took 1 hour and 10 minutes, that's not too bad.